I enjoyed Gen-Fed; those of you who follow me on Facebook know that already! I feel more comfortable working within NARA, with the Staff and the records, and even the website, than I did before I arrived. Here are some of my research observations of my week. Specific tips will be covered later. One of the easiest records to pull is a Civil War pension or a Civil War Compiled Military Service Record (CMSR). If you have individuals who served in the Civil War, I recommend that these records be pulled first. Pick up the military form, fill it out, take it to the desk on first floor. They will review your work and make sure you have entered things correctly. You then put it into the pick up box. And you are done with that request. You can put in a maximum of 4 requests per hour. Picking up the pension/CMSR isn’t that hard either. After the pull of the record, you go to the research room on 2nd floor, turn left and go to the far wall (in the next room) to request your file. Of course, there are security stops along the way but the actual process of picking up a record is simple. Have fun! I call these types of records “episodic;” that is, you request a file by given & surname and you get it. You review one, and that is it. Bounty land records fall into this category as well (with an extra step). “Longitudinal research” is what I call subject research. Longitudinal research “feels” more like a fishing expedition where you are looking at subject files (not filed by surname) that may or may not directly refer to your ancestor. NARA is really set up for longitudinal research. Therefore, one week will never seem enough for this type of research. I had to manage my expectations. We get used to “grazing Ancestry” and finding (or not) hits with some regularity. Archival research, especially longitudinal research, is contemplative and strategic– one cannot expect positive results on the hour. It just doesn’t happen. If you get a “hit” with one record a day—consider that a good day. Two?–total win. I think my comments above go to my core issue–NARA research is different, and it has something to do with the fact they file by record group, but there is more to it than that. NARA seems overwhelming, but like life–you take it a chunk at a time. In any archive, there is a total dependence on the archivist that is not true of researching in a library. That is not a bad thing; I love having interactions with a deeply knowledgeable archivist. I am grateful for the experienced archivists and I am very gentle with those that are still learning the records. All of us were there at one time or another. In archives, we have to “ask for help.” And, it’s OK if we do! I could have been better prepared for my Gen-Fed experience, — maybe “better” is the wrong word. Maybe the right word is “differently.” It is one of those things where you say to yourself, “If I knew then what I know now…” I should have done more reading of the NARA publications, particularly of the ones I would most likely access–Civil War Records and land records. I have some NARA directories in my library and I should have reviewed those. I should have spent more time online getting very familiar with the website…shoulda, shoulda, shoulda. The reality is that now that I have gone through Gen-Fed, those books and the website make a whole lot more sense than they did before, so I question whether I would have been more knowledgeable or just more frustrated, if I have done more reading. GenFed actually leaves you some time to conduct research during the week–the urban myth of no research time at Gen-Fed is false. Malissa and Debra have done a good job of scheduling. For example, I had the form filled out at Archive II and put into the pull box, before we even started the presentations in the morning. When the morning talks were over, I went and picked up the file. Since I had brought my lunch, I could review the file and then eat lunch all before the afternoon sessions. Did I mention that I loved my classmates? They were all so smart and so eager to learn. It was great fun sharing discoveries and being supportive even when that special record just didn’t happen! Thanks. Next blog will be some specific hints for a successful GenFed experience or NARA visitation. What I have done since the last posting: vacationed with my family on the Cape, presented at the Falmouth Genealogy Society, worked on and submitted my presentations for the International Germanic American Conference; and responded to questions from the registrants for the next Certification Discussion Group and added folks to the wait list. (I already have a long wait list for the Fall and even winter session, but don’t let that impede you from sending me an email and signing up–the list isn’t going to get shorter if you wait.) And, of course, GenFed and some of my own research. This past week I was delighted to attend the Salt Lake Institute for Genealogy (SLIG) at Salt Lake City, Utah and I want to tell you a bit about it. An institute for genealogy is usually five days of intensive study and lectures on a single topic related to genealogy. This year there were 14 tracks and you had to pick one– a difficult task. I selected “Family History Law Library” taught by Judy Russell (left) and Rick Sayer (right; I’m behind Rick.) in the photo at left. Other speakers included Claire Bettag (Civil Law), David Rencher of Family Search (Irish Law) and Warren Bittner (German Law). I always come out of these institutes with a larger number of genealogy buddies, new information on the topic and a renewed enthusiasm for genealogy, which I did not have before. This session was no different. Working in the law has always intimidated me and so I hoped to come away with some basic knowledge of how to think about my immediate problem and how to then access the law. What is the type of court where this problem might be resolved? : local, state, Federal, or special? Could the topic be covered in a chartering document, like a constitution? If so then you need to look at the constitution or similar document of that state or country. Is it Statutory law? And, if so, is it territorial, colonial or state? Is it common law and covered through precedent? Once you have answered the above questions then you have a road map to finding the answer to your question in the law. The state laws can best be found by googling name of the state, “law” and then any additional identifiers–“territorial” or “colonial” law, and type of problem, e.g. mental health, immigration, or voting age, for example. These documents are often found on a governmental website for the state of interest. What I have done since the last posting: Attended SLIG, started “bullet journaling” based on an Association of Professional Genealogist Quarterly article (it has greatly improved my efficiency.) Have alerted several groups etc. that I have received the credential of Certified Genealogist; interviewed 3 new clients; continue to work on transcriptions of findings from my summer sabbatical, cleaned up some webinars and conducted two (Illinois and Southern California with Wisconsin at the end of March.) Did some research on my elusive Eilerts and withdrew my proposals from APG-Professional Management Conference to be held in September in DC. I am still waiting to hear from BYU, and I did a bunch of other stuff related to being SGS President. Whew! busy month. Salt Lake Institute of Genealogy (SLIG) 2017, Class 9, The Family History Law Library, photograph, January 2017, digital image, Shelley Lewis, photographer, used with permission; SLIG 2017 (https://www.facebook.com/groups/SLIG2016/ : accessed 2 February 2017, 8:10 am). I am just coming off the excitement of NGS in sunny Florida and I get to go to sunny CA! Jamboree 2016, sponsored by the Southern CA Genealogical Society, is a major regional conference held in Burbank CA. I am looking forward to my favorite Seattle speakers–Janice Lovelace and Mary Roddy. But, who can resist Kenyatta Barry or David McDonald or David Rencher or Jay Fonkert or Annette Burke Lyttle or…..well you get the idea. How fun is this? I will be giving two of my favorite presentations…”Fire Insurance Maps” and “Blogging your Family History.” They are very different presentations but then I have a more eclectic package of presentations than many. FIM is a “tried and true” presentation. I love this presentation as it combines my architect’s love of 2 dimensional representation (the map) of a 3 dimensional reality (real life!) and is a wonderful resource for answering late 19th c. and early 20th c. genealogical questions. “Blogging Your Family History” is a new presentation, but one that I feel comfortable in presenting since I have been blogging on a variety of topics including my family on and off for almost 4 years now. It is so easy to do and makes the daunting task of writing seem very manageable. There are some great examples out there as well….people who are already blogging their family history and doing a very good job of it. I will cover how you can set up a blog in (WP says 3 steps), I say, 6 steps. It should be fun. I just signed up for the live streaming of the DNA Day lectures. $99 for 6 lectures. Seemed like a deal to me. A “deep dive” into DNA is on my to do list right after submission of my portfolio. I will be traveling the day the lectures are given live, but will listen to them after the fact. I am anxiously awaiting the app for the conference. I saw it in beta test last week and fooled with it a bit. It was supposed to be in the App Store today but I don’t see it yet . Maybe by the time I post this it will be! What I have done since the last post: I am getting ready to run copies of all parts of my portfolio! This is exciting. It’s the first time I will see all parts together. On a scale of “the good, the bad and the ugly” I am out of the “ugly” phase and into the “bad” phase. It’s coming. Just when I feel positive–I get a shot of reality and go–whoops, gotta do that! I attended a session today on the Swenson Swedish Immigration Research Center presented by a former librarian who gave us lots of inside tips. It was very interesting. I will be visiting this summer. What is a FAN Club? Friends, Associates and Neighbors comprise any person’s FAN Club. These are the individuals who surround us and who we interact with regularly. We call upon them to assist us in our dealings that generate documents that survive to today. More importantly, we find our FAN Club being kin, especially before the 21st century. For example, when it is time to fill out the request for the Civil War pension and you need to have some attestations of your service and good character. Who are you going to ask to give character witness? –your comrade in arms from your unit. Your unit was comprised of individuals from your state and often included kin. It is time for you to emigrate. Do you just pick up and go?–no, you probably entice others from your small town to emigrate as well and all appear on the passenger manifest together. Do you shoot darts at a map to determine where you are going to settle?—again, no. You instead pick an area you have heard about, because others from your parish have migrated before you to that place. These are just 3 examples of different FAN Clubs. As you can see one person can have many FAN Clubs at the same time and individuals may “occupy” overlapping groups. In very difficult problems, such as the identification of John Watts, not only did the FAN club include multiple types of clusters, but it grew in numbers of individuals as more evidence was found. A FAN Club is never static. It will increase in size as new information is obtained and new names are added. It will shrink as individuals are identified who do not answer the research question. Principle 1: and object (individual) cannot be in two places at the same time. James Smith #1 farms on Smith Creek and James Smith #2 farms on James Creek in 1850–at the same time. These are two different James Smiths. Understanding the distances one could travel in the time frame of investigation is necessary to eliminating individuals from a FAN Club. Principle 2: one object (individual) cannot occupy the same time twice as someone else. James Smith #1 resides on land from 1812 to 1850. James Smith #2 resides on land from 1830 to 1860. These are probably two different James Smiths because their timelines are not in alignment. These are extremely simplistic examples and are only used to illustrate a point of identity of same named individuals; not to illustrate reasonably exhaustive research, which would be necessary to actually eliminate John Smith #2 in each instance. Same named individuals can only be separated by using reasonably exhaustive research and having alignment of geography, time AND the FAN Club. I would also suggest that you probably use it more frequently than you think. Your FAN Club size may be small and you can quickly eliminate all but one. This type of research is particularly critical for Irish and Scandinavian ethnic groups whose naming practices result in many individuals having the same name. What I have done since the last posting: attended the NGS 2016 conference, blogged about the conference, presented twice and became inspired as I read the submissions of others for certification at the BCG booth. Next up? Whidbey Island GS and Jamboree! Next blog (probably)—coincidence and decision-making. Photo of Elizabeth Shown Mills & Jill Morelli, taken at the request of Jill Morelli by an attendee, May 2014. Photo taken NGS 2014 conference in Richmond, VA. FAN Club is a group composed of friends, associates and/or neighbors devised by Elisabeth Shown Mills, also called “cluster research.” The use of FAN Club principles are used repeatedly in solving genealogical problems. What are the “Lessons Learned” after lecturing at the WSGC 2014? 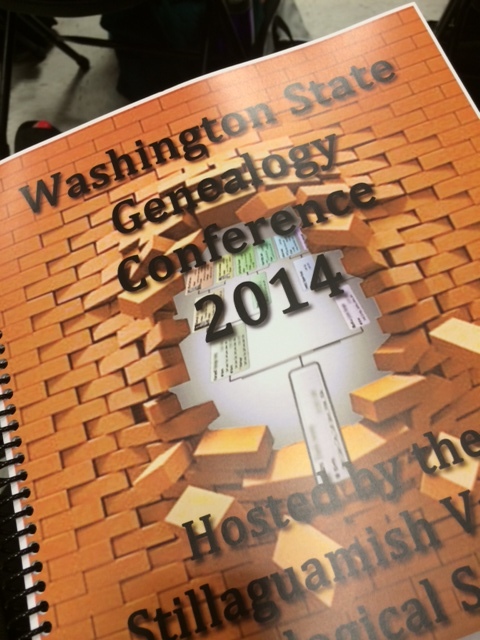 I was honored to be selected to present at the Washington State Genealogical Conference 2014 in Arlington, Washington this month. Of the five ideas for presentations that I submitted, the conference planning committee selected “Just Do It! Writing Your Memoirs & Self-Publishing.” The venue was terrific and was attended by 300 + attendees. Josh Taylor of Our Family Heritage was the keynote speaker on Saturday. Eric and Karen Stroshien did a great job in planning it. I had an audience of about 40 who were totally engaged and a delight. They asked terrific questions of which I could even answer! I was so energized by the audience, I felt good all day. My good friend Steve Morrison attended the session and like all good friends he gave me a great critique. He thought I truly engaged the audience at the beginning but lost them at the end. (I tried to do an actual publication but due to a mix up in the timing, I did not quite complete. This is a big no-no!). I should focus more directly on the topic–probably shouldn’t have taken questions during the presentation as they consumed too much time and he thought it siderailed the presentation. He noted that some of my slides had a point size of font that was too small. (The experts say 32 point. I increased mine to 24.). It is better to stop early than to run out of time. He also thought my handout could be much improved. So, I am also excited that I will be presenting three presentations to the Jefferson County Genealogical Society in March 2015. This will be an all day event. While we have agreed on terms, they have not decided which of my presentations they wish to hear. I will find out that information in September. The time in-between sessions must be managed to allow yourself time to “reset” (physically and mentally) for the next presentation. If you have a product to sell, include in the contract the rights to sell at the event. i don’t have anything to sell but I do have a little “give-away”. I have applied to two other conferences to speak and am waiting to hear from them. I have already heard that I was not accepted to present at FGS in February. I plan on submitting to at least two others soon. This is fun! 12 October: “Soldiers, Spies & Farm Wives: the Changing Roles for Women during the Civil War” A look at how Rosie the Riveter was not an anomaly. 9 November: “Using the Non-Population Schedules” For context and even restricted records, nothing is better than the non-population schedules–short of paying the lawyer! 7 December: “Family Myths: Using Analysis & Correlation to Resolve” Do you have an Indian Princess in your family? Well, somebody has to! We will explore how to resolve this often puzzling family stories–and sometimes they are true! What I have done since the last posting: Well, not exactly, but I really worked on the presentation for the 28th of September. It was lacking a construct which popped into place this weekend. I really feel like it is in a good place now. I need to revisit the content of my lecture proposals; I do not believe I have done a very good job of pointing out the uniqueness of the different proposals. I am getting very comfortable with my hardware. That’s good. The new laptop is doing great. I worked up a lecturing contract for Jefferson County and worked on a client report which is very interesting–Scotland! What Kind of an Historian Are You? As you may know I am coming off an intensive month of conference planning for the 2014 OGSA (Ostfriesen Genealogical Society of America) Family Reunion. The conference culminates in a banquet where we honor our attendees and volunteers for the year. This year I volunteered to present some thoughts to the group as a whole. They are presented here in almost the way it was presented. Delivered 6 August 2014; based on the book The Methods and Skills of History: A Practical Guide by Conal Furay and Michael J. Salevouris. What is your reason for being at this conference? …to have access to the Ostfriesen Library collection? …to meet with Ostfriesen friends? …to learn something new about Ostfriesen culture or genealogy? Each of us attended this conference for different but similar reasons–but ultimately to deepen our understanding of our ancestors and their Ostfriesen culture and customs. The ties that bring us together every two years are strong as we make new and renew friendships. I hope that you have met some new Ostfriesens these past few days–I know I have, but what ties us together in-between conferences is our common love, some times obsessive passion for, the deeper understanding of our ancestors. It is our sense of that historical string that ties us, not in a genetic sense although that is real, to those who came before us. And like us our descendents will continue the connection. It is by understanding the customs and traditions of the past that we understand better the discussions of today. This makes us not just genealogists but historians. But, what kind of historian are you? Remember when you were in high school and you took history tests? My goal was to memorize the dates and places and be able to give a sentence (at most) about why that event was important. But the “whys” were just another fact to memorize. I did history because I had to. Think of that as a Stage 1 Historian. Is that you today? A genealogist at this Stage would gather the dates and places to fill out the pedigree chart and be done. Or, are you a Stage 2 Historian–one who sees that history of your ancestors, and of the events that shaped their lives, as a sequence of events over time. You are beginning to see how your ancestors might have been influenced by history. But, ultimately you wish the historians would just decide on what happened when and tell us! I mean, certainly there is only one version of history and they should just teach it. And can’t it all be reduced to a tidy timeline? The genealogist at this stage will record the facts but also realizes that other documents may be of interest and seeks them out. They are interested in those court cases where one brother sued another or what the experience was as a Civil War soldier. but interpretation of those events is seen as just too much speculation and not worthy of deep thought. A genealogist sees that they have information that conflicts but doesn’t quite know what to do with it. A Stage 3 Historian instead sees history as a complex conglomeration of events and is so complex that you cannot see where to begin to make sense of it. At Stage 3, we now understand that history can be taught with an economic overlay, or focused on religion or on the societal impacts–and they all may be right–and all different. History certainly isn’t like the mathematics or chemistry where there are theorems and those theorems are not broken. This stage is interesting because we, as genealogists, are more confused and feel like we lack more knowledge than we did in the previous two stages. In other words–we now know what we don’t know–and it’s intimidating. But, we also now are starting to understand how macro history issues can directly influence the decision making of our ancestors–or our personal microhistory. We see that there are different points of view and each historian is conveying a unique point of view. We are starting to be critical thinkers and have what I call, the ability to do “mindful analysis.” We start to unravel and re-assemble those conflicts and see that we can identify errors in documents and understand why they may have been made. But, there is a Stage 4, — where we start to see that the historian is interpreting history in their own writings. The writer-historian picks some things to write about and discards others; sees that some events are more meaningful than others. He then interprets those events into the context of the time and the decision making of people of long ago. At this conference, we have had the luxury of hearing about the fate of the poor, and the Dutch emigrants of the 16th century while sitting in the comfort of a nice hotel in Minnesota—will that 16th century perspective change how we feel now about the poor and the immigrants of the 21st? Should it? Will we read our newspapers with a question that asks—”I wonder what the writer is not telling us?”—as we now know that this question is just as important as reading what he IS telling us. Our understanding of our ancestors and the events that shaped the decisions they made is deepened by the swirl of historic events around them just as we, too are being shaped by the events which swirl around us. This year I challenge you to write some portion of your personal story or to write about your ancestors. There is no single act you can do that will influence your microhistory for your descendants than that simple act. In the process, I guarantee, you will move from one stage to the next on your own genealogical, –and yes, your personal historical journey. Thanks to all the volunteers. No conference is possible without the help of volunteers. Volunteers set up and took down booths, volunteers staffed the booths, were room monitors and assisted with registration. And those are just the activities we can see! There are hundreds more volunteers behind the scenes working hard for the year + before the event. Special thanks to the host society, the Virginia Genealogical Society. I hope you can take a well deserved vacation in your beautiful state to decompress. Thanks to the NGS staff and Board. We know there are not many of you but you seem to multiply yourselves during this time of intense activity. You make sure the contracts are in place with hotels and venues and coordinate the sponsored lunches and activities, etc. etc.. 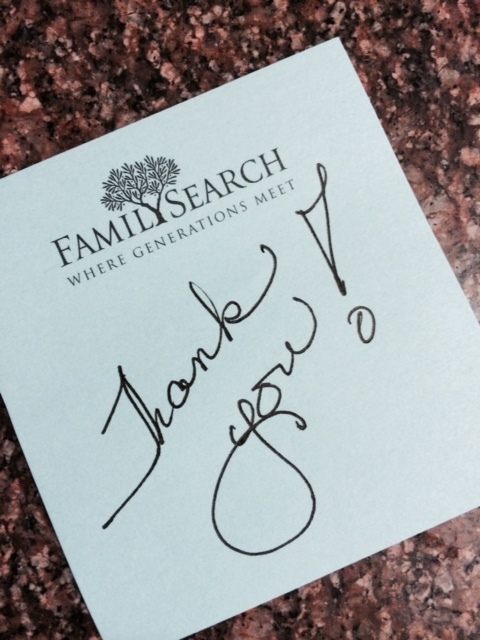 Thanks to the instructors, who consistently bring terrific content so we can all learn new skills and explore new record sets which make us better genealogists. And thanks, to the attendees. I met such fabulous people and had so much fun, you make it a joy to attend. I make a point to meet 3 new people a day and easily accomplished my goal, usually before lunch! meeting Ms. Tweet AKA Jen Baldwin. She is as terrific in person as she is in 140 characters. meeting Debra Hoffman–I hope a new friend. She and I had a terrific conversation at the GSG sponsored lunch and who I ran into again later that day during the fire drill during Craig Scott’s presentation on Confederate Soldier research. the 13 Washington attendees (NE had 2). I think I connected with 8? See you next year in St. Charles! What I have done since the last posting: fed my genealogy obsession almost (but not quite) to overload!